In this area of the Apparel Search fashion brand directory, you will find men's fashion brands from leading apparel companies and fashion designers. On this particular page, you will find information regarding men's clothing with the Hurley brand. 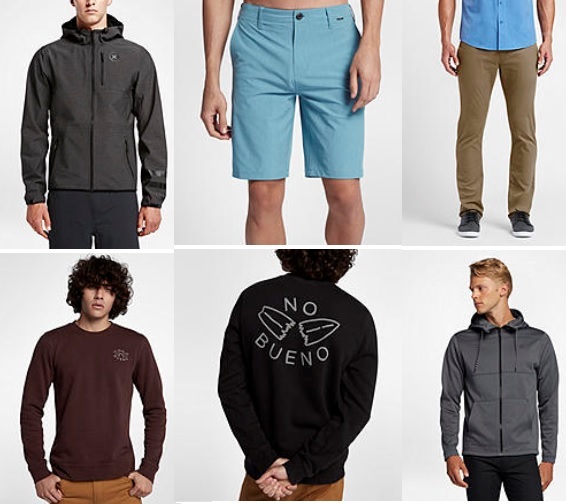 You are welcome to utilize this section of our clothing guide to review Hurley news, Hurley blog posts, Hurley photos, and more. Please understand that you may run into a few photos or a tad of information that does not actually pertain to the men's Hurley fashion brand. Unfortunately, no search technology is absolutely perfect. We will continue to do our best to bring you as much information about the men's Hurley fashion collection as possible. Hurley is an American multinational corporation that is engaged in the design, development, manufacturing, worldwide marketing and selling of surf apparel and accessories. It all began with BOB HURLEY. Surfboard shaper and visionary Bob Hurley started the Hurley brand in 1999, embracing a life informed by the ocean and the spirit and creativity of youth. Prior to starting Hurley, Bob made a name for himself as one of the preeminent young board shapers in Huntington Beach, and soon the world, eventually becoming the go-to shaper for the 1978 World Champion, Rabbit Bartholomew. Obsessed with making boards that were lighter, faster and more flexible, Bob eventually translated that innovation ethos to board shorts, and the rest is history. Today, you can find Bob “product-testing” at home in Newport Beach, Hawaii or at some of the best waves around the world. Learn more about the Hurley men's apparel. You probably now the answer to this question, but we are going to ask it anyway just to make sure. What are rash guards? If you don't know what a rash guard is you, also need to figure out the meaning of the term board shorts. Please don't tell me that we have to explain to you the meaning of swimwear as well. If that's the case, you may want to just take a nap and stop searching websites. If you have changed your mind and do not wish to research the brand Hurley, you can use the search engine on this page to find another clothing label that may be of more interest. Apparel Search is a leading guide to fashion, style, clothing, glam and all things relevant to apparel. We hope that you find this Hurley page to be helpful.